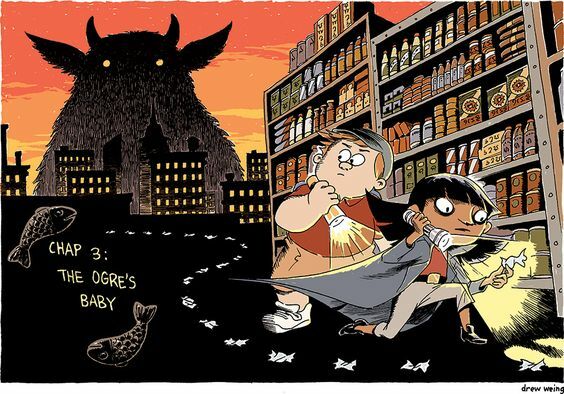 I don't think I can put into words how much I love The Creepy Case Files of Margo Maloo by Drew Weing. Not only is Margo just about the coolest girl detective I have encountered in quite a while, she is kind of a ghostbuster. More accurately, Margo Maloo keeps the peace between the world of the humans and the hidden world of monsters in Echo City. 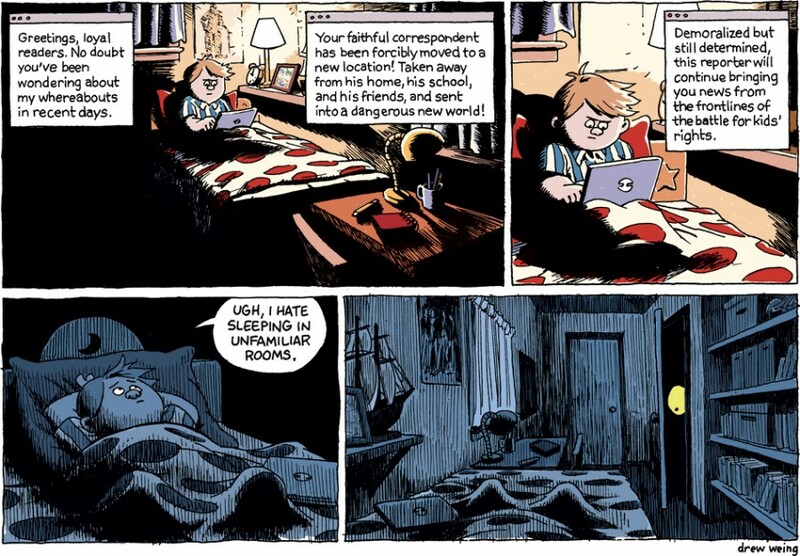 Best of all, The Creepy Case Files of Margo Maloo started as a web comic and continues on line where you can read new chapters! 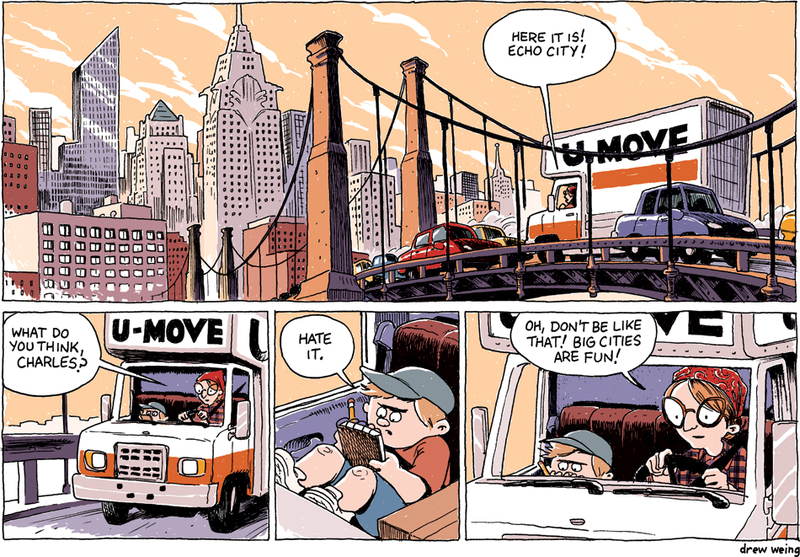 The Creepy Case Files of Margo Maloo begins with Charles Thompson's move from a small town to the big city, a move he's not happy about. The Thompsons are moving into the Bellwether, a former hotel built in 1925 with authentic Art Deco fixtures. Along with a few other residents, they will get to live there for free while Charles's dad fixes the place up. Charles, not much of an outdoors kind of kid, fancies himself a budding journalist and writes a blog. Charles meets Kevin, a neighbor who is trying to break a world record, any world record. Kevin tells Charles like where the best candy store in the neighborhood is and what to do if anything weird is going on in your apartment. It just so happens that, the night before, a huge monster crept out of the closet after Charles turned off the lights. 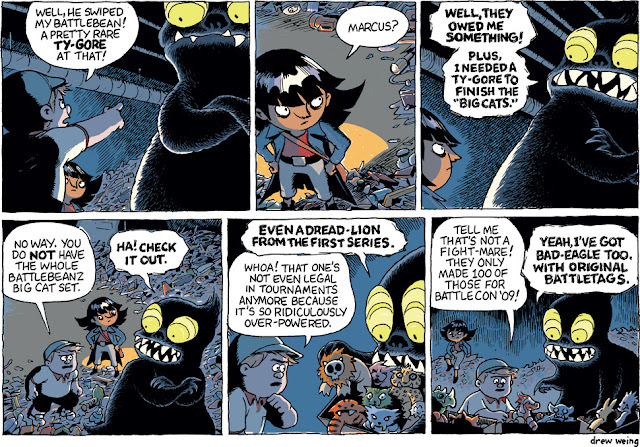 Kevin hands him the business card of Margo Maloo, monster mediator, and the adventure begins. 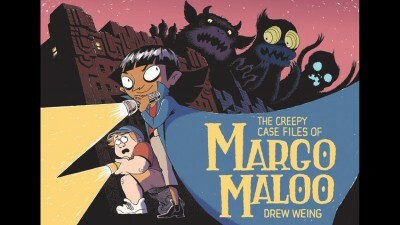 Drew Weing brings a fantastic sense of humor, a marvelous eye for detail and a brilliant talent for world building to The Creepy Case Files of Margo Maloo. She and Charles head to the lair of a local troll named Marcus who collects Battlebeanz, specifically the Big Cat set. In one of Weing's superb details, he creates names for many of the Big Cats like "Dread-Lion," "Fight-Mare" and "Ty-Gore," and Marcus and Charles have a fast paced conversation about them. Another great scene comes at Ms. Koff's store, a grocery store for monsters hidden under a Quickmart. Weing's illustrations for these scenes are dark and creepy and filled with things you will pore over again and again. Once he gets over his initial fear, Charles is hooked and wants to tag along with Margo, even suggesting he become her partner after he helps her find a missing ogre baby with a serious sweet tooth (yet another chapter with great twists, this one involving a kidnapper who wears a baseball cap and takes notes all the time but is not Charles...) In the end, Charles settles for assistant when Margo tells him he knows too much. She either has to put him to good use of have him "' accidentally' run into a pack of hungry ghouls." Best of all, Weing's layered story ends with a few pages from an encyclopedia of monsters with Margo's notes in the margins! Which reminds me, another super cool think about The Creepy Case Files of Margo Maloo is the trim size of the book, which is exactly like a slightly oversized reporter's notebook! I can't wait for the next installment of creepy case files!